Those of you who have been fortunate enough to attend one of the Gay Games know what a wonderful life-changing experience it is. And now the Federation of Gay Games (FGG) Scholarship Program has just been offered matching funds of up to U.S. $20,000 by Martha Ehrenfeld and her wife, Carla McKay for monies donated to the fund now through December 31, 2016. If you read Martha’s story in the November “Faces of Sports” issue of Compete Magazine, you know that the Gay Games has made a significant impact on her life. In fact, she met and fell in love with Carla, her women’s tennis doubles partner while training for the 2010 Cologne Games. They married that year and actually honeymooned at the Games where they also won the gold medal in women’s B doubles tennis. Describing her Gay Games experiences, Martha says that when you are able to come together in one place with a huge group of LGBT athletes, it is “a uniquely positive and powerful experience … that inspires you to reach out and help others who think they are alone.” As a result, she and Carla have been active donors to the scholarship fund for many years. Their hope is to inspire people to donate so that deserving but economically-challenged athletes and artists from underrepresented populations and regions of the world will have an opportunity to enjoy what many of us take for granted. $2,500 covers airfare, registration costs and meals for 10 days. 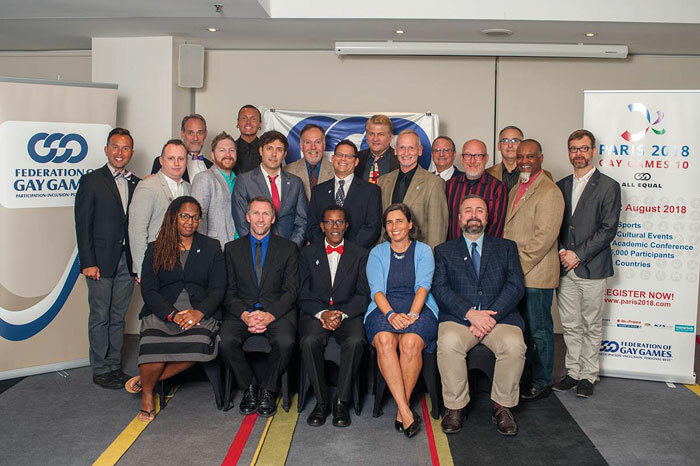 The importance of the scholarship fund is shown by Gay Games 9 in 2014 when the FGG was able to provide support to 47 recipients from the following countries: Argentina, Brazil, Chile, China, Croatia, Kazakhstan, Macedonia, Nepal, the Philippines, Russia, South Africa, Slovenia and Sri Lanka. The FGG Scholarship Program is funded in part by the Roy M. Coe Scholarship Fund that since 2002 has been helping to bring participants to the Gay Games. As we reflect on our own giving during this holiday season, it is worth remembering founder Dr. Tom Waddell’s vision of an Olympic-inspired competitive sports festival for the global LGBT community that would really be open to everyone who wanted to take part – there would be no requirements or qualifications to participate. Although it’s been 35 years since Dr. Waddell shared his idea with others in the LGBT community, his founding principles for the Gay Games – Participation, Inclusion and Personal Best™ — still apply. The Paris 2018 organizing team includes former members of the FGG board and leaders of the Paris sports and cultural communities. With support from the city of Paris, the Ile de France region and the national Ministries of Sports, Culture and DIGES (the inter-ministerial delegation for large sporting events), Paris 2018 Gay Games 10 involves the entire Parisian community as well as other communities from across France. The FGG board of directors for 2017 that recently met in Sydney, Australia (shown below) includes Martha Ehrenfeld who is willing, as the saying goes, to put her money where her mouth is. So please take advantage of the generous offer she and her wife are making. The FGG requests your support by donating to the Gay Games Scholarship Fund before the end of December by going to: www.gofundme.com/fggscholarship. And please be sure to share your own story, as well. Photo courtesy of Federation of Gay Games, Board Picture.